Astral is full of delicately balanced and nourishing ingredients. It can be used daily to keep your skin soft and smooth and can tackle even the driest of skins. 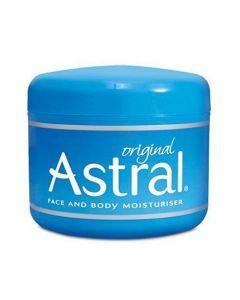 Astral is an all over moisturiser. 200ml for at home and travel. It can tackle even the driest skin on your elbows and feet. Versatile Astral can also be used as an after sun lotion and makeup remover. Massage directly into the skin. Use on hands, face and body for intense skin moisturisation and protection.